Homeowners embarking on a kitchen remodel project can turn to the experts at Premier Kitchen & Bath. We’ve been serving Phoenix, Arizona, and nearby cities since our founding in 1994 and, in that time, have won multiple awards, including numerous Best of Houzz awards and an A+ rating with the Better Business Bureau, for our outstanding dedication to customer service. A Discovery consultation – During this complimentary, in-showroom consult, we’ll discuss your initial ideas for your kitchen remodel, as well as your budget and expectations. A Design and Planning meeting – Our designers will use your initial vision as inspiration but then will add their own ideas to create several 3D renderings of a new kitchen that will go above and beyond your expectations. Follow-Up Revisions – This phase will ensure that the design you choose reflects your aesthetic preferences and functionality needs. Build – When the big day comes, we’ll assign a Project Manager to your kitchen remodel project who will effectively manage the installation from start to finish, keeping you updated throughout the process. 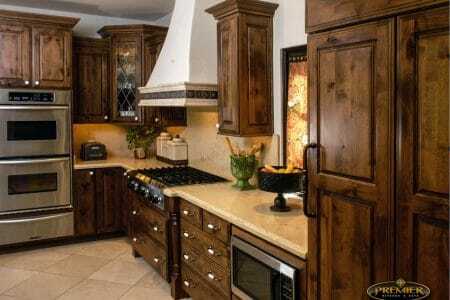 So, are you ready to learn what’s possible with a kitchen remodel project for your Phoenix, AZ, area home? Our designers are waiting to impress you. Contact or visit Premier Kitchen & Bath today to set up your free Discovery consultation.